Jane Beggs-Joles began her horticultural career at River Farm, headquarters of the American Horticultural Society, where she worked as a gardener and intern for two warm, humid northern Virginia summers. Despite the charms of that Potomac estate, she moved to Michigan to earn her B.S. in horticulture from Michigan State University and then undertook an M.S. degree in agricultural economics. Jane joined the team at Spring Meadow Nursery in 1999, five years before their 2004 partnership with Proven Winners. Jane’s current position of licensee analyst enables her to enjoy two of her passions: excellent plants and well-organized spreadsheets. 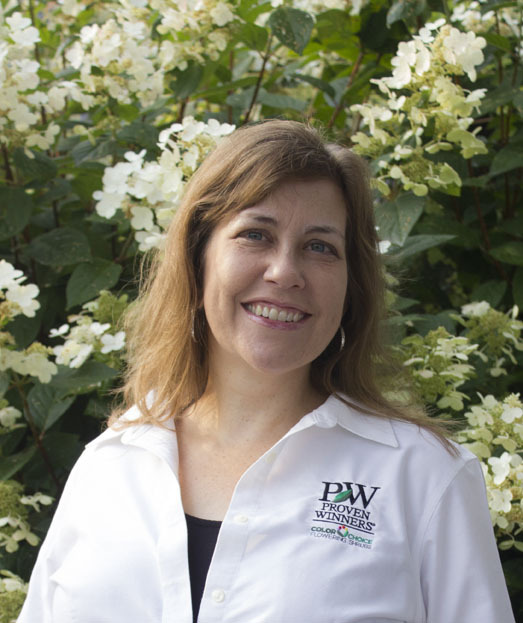 She firmly believes that there is a botanical answer to any landscape situation, and strives to make it easy for people to choose the right plant in the right place. Proven Winners ColorChoice Shrubs are selected from the best the world has to offer – from far-away places like Korea and Poland to our stateside development and trial facility in Grand Haven, Michigan. Now, get the inside scoop, along with a bit of wit and humor, from a professional horticulturist who knows these shrubs because she’s grown them. Jane will share interesting tidbits about new introductions and old favorites alike, along with landscape ideas, trends, and advice on making our line of award-winning flowering shrubs work for your business. 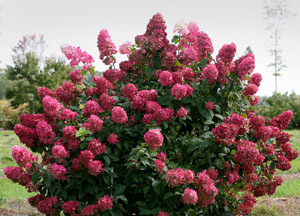 You’ve probably got some flowering shrubs planted in your yard, which is to be expected. (If you don’t have anything planted in your yard, we need to talk). 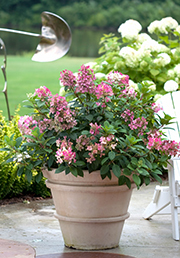 What’s not so expected is flowering shrubs on your deck or patio. Annuals are nice, but maybe your planters could use something a little bigger, too. Or something evergreen, even. After all, many of us are outside on our decks year-round. By all of us, I mean my husband, who grills twelve months of the year. I think having some evergreens on the deck to keep him company while he grills my Valentine’s Day dinner is very thoughtful of me. 1. Size matters. 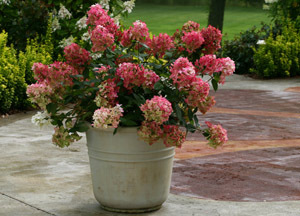 A compact plant will usually look better in a decorative pot; compact varieties typically look good at a smaller size whereas full sized ones may look gangly until they are older. 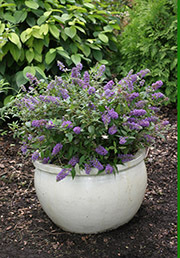 Consider Lo & Behold® Buddleia vs. an old-fashioned butterfly bush. Those older varieties are rangy and not very attractive as young plants but a 1 gallon Lo & Behold® is a nice, full mound of fragrant flowers. 2. But size isn’t a deal breaker. Some plants, evergreens in particular, can be very attractive as young plants. It’s fine to plant one in a container to enjoy for a few years as long as you’re OK with discarding it when it outgrows the space. Or you can plant it in your yard after enjoying it on the deck for a while. If you don’t want to throw out a plant or don’t have space in your landscape to eventually plant it there, look for a dwarf variety like Anna’s Magic Ball® Thuja. 3. Know your zone. A good rule of thumb is that you can winter a plant above ground in a container if it is one zone hardier than where you live. 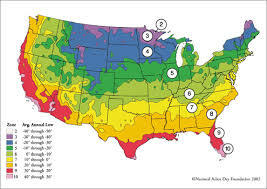 So if you live in USDA Zone 5, you should be able to overwinter patio plants if they are rated USDA Zone 4 or hardier. Good choices for most of North America are Hydrangea paniculata like Bobo® (USDA Zone 3)or Arctic Fire® Cornus stolonifera (USDA Zone 2). 4. Plants need water year round. Dormant doesn’t mean dead. Cold might not be what’s killing your container plants; freeze drying will do it, too. If your containers aren’t getting some natural precipitation during winter, you will want to water them occasionally. While they don’t need nearly as much water as they do during the active growing season, they will need the soil to stay moist during dormancy. Just don’t overwater, especially your butterfly bush. 5. Look up. 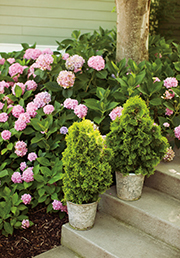 Tree form flowering shrubs like a Quick Fire® hydrangea tree allow you to enjoy the hydrangea flowers you love and leave plenty of room for smaller plants at the base. 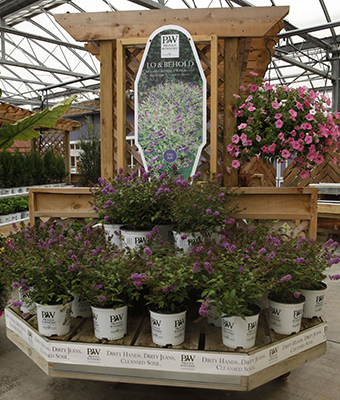 Many garden centers will help you design a container and even plant it up for you with seasonal refreshes. This is a perfect way to add a few more garden favorites to your yard, even if you’ve run out of space in the landscape. Zone. Know your zone. Write it on your hand if you need to. Know what it means: if you live in USDA Zone 5, for example, anything rated hardy to 5 or lower (4, 3, 2, 1…) should be winter hardy in your area. Look at the warmer (higher number) range, too. If you’re in USDA Zone 8, a plant rated 3-7 isn’t going to be happy in your climate. Sun and shade. Full sun is at least 6 hours of direct sunlight each day. Part shade is 4-6 hours of direct sun per day. Anything less than 4 hours of sunlight is shade. A plant’s label may indicate full sun or partial shade. In the northern part of the plant’s range it will need more sun, and in the southern part of its range it may prefer part shade. Plants flower more in sunshine. A plant may be quite happy in part shade, but it will not flower as heavily as it would in full sun. What to plant in shade: Buxus, Diervilla, Itea, Kolwitzia, Taxus. It doesn’t matter how much they fertilize, water or plead with the roses and tomatoes – they won’t grow well in shade. Friends don’t let friends plant full sun plants in full shade. Prune summer flowering shrubs in late winter or early spring. Prune spring flowering shrubs right after flowering. 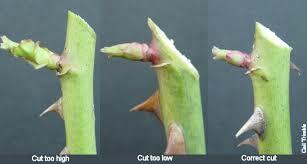 It’s better to remove a few branches completely rather than making a shallow trim all over the plant. Pruning just the tips of branches encourages growth on the perimeter and can lead to a hollowed-out plant with lots of leaves on the tips of branches but nothing in the interior. Fertilizing. Controlled-release fertilizer when planting is a good idea. If the foliage looks a little yellow in mid-summer you can give it some liquid fertilizer, but don’t fertilize in late summer. Late season fertilizing can encourage soft new growth that won’t harden off for the winter. Sometimes gardeners want to put weird things like tin foil or diapers in the soil. Don’t encourage this. If they don’t want to buy fertilizer from you, steer them towards the composters and help them set up a compost pile. Moisten the soil with a light sprinkle. Then water deeply until the ground is wet. It’s better to water less frequently but for a long period of time rather than to give a plant a light sprinkle every day. Deep but less frequent watering encourages a plant to establish a good root system. 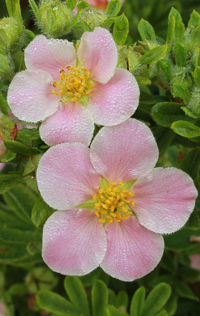 An established shrub will typically not need supplemental water to survive dry periods. Plants under water stress will not flower as much. The plant will be ok, but your flowers won’t be so abundant in dry summers. Size matters. Look at the label. Don’t choose a plant that will get too big for the space – why set yourself up for the extra work of pruning something? 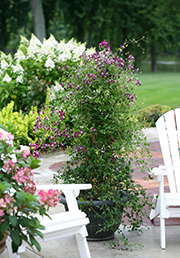 Dwarf or compact varieties are a better choice for most residential landscapes. They may cost a little more or be smaller in the container than traditional varieties, and customers may question why they should pay more for what appears to be less plant. (Dwarf varieties usually take longer to grow.) This is your opportunity to explain how the right sized plant is the better choice and will save them time and money in the long term. Deer. There is no such thing as a deer-proof plant. If they get hungry enough they will eat just about anything. But there are some plants that are less appealing than others: Buxus, Spiraea, Caryopteris, Buddleia and Potentilla are good choices. Hydrangeas. This is a big subject. Print out the pdf and make sure everyone on the team has a laminated copy in their pocket. 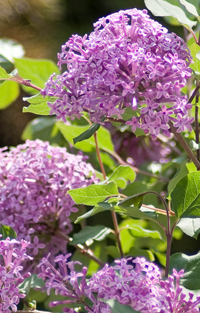 Looking for more information about flowering shrubs? We have some quick, 30 second videos of our varieties available on Youtube. These are an easy way to get your staff up to speed on the new plants you bring in every week. Thirty seconds learning about a new variety – that’s just enough time to eat a donut. Plant knowledge and a little sugar rush will help them sell more plants! Have a great spring! Sure, sometimes it’s great to go big. Nachos, for instance. Small is just a couple of sad tortilla chips on a plate. But sometimes going big isn’t the right call. This is especially true for plants. We’ve all seen the yard with a huge tree blocking the front window. That cute little Colorado blue spruce grew up to be a forest-sized specimen, and a suburban yard is not big enough for its magnificence. Forsythia: Forsythia does one thing, and does it well. But when those cheery yellow flowers are gone you’re left with nothing ornamental the other 50 weeks of the year. 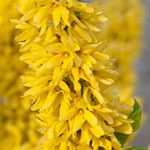 Minimize the square-foot investment in spring flowers by using a dwarf variety like Show Off® Sugar Baby Forsythia. It does what all forsythia do, and does it better: yellow flowers line the stems from base to tip. Best of all, it grows just 1.5-2.5 feet tall! 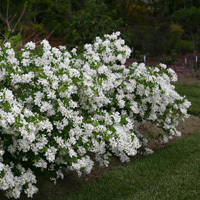 Pearl-bush: Another one-hit-wonder, old-fashioned pearl-bush is covered with pure white flowers in spring. It’s a delightful addition to gardens where the white flowers are the perfect complement to spring bulbs. 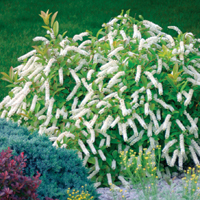 While older varieties may grow 6’+, Snow Day® Surprise is a compact plant that grows just 3-4’ tall and wide. This could be a great plant to sell along with fall bulbs. Hydrangeas: Moving on to summer, we need hydrangeas. Doesn’t everyone? There are small versions of favorites like Quick Fire® and ‘Limelight’: check out Little Quick Fire® and Little Lime®. They are about half the size of the originals! If you’re looking for something really small, Bobo® is just 3’ tall. These cold-hardy plants can overwinter in containers in most of North America so they’re ideal for patios. 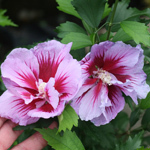 Rose of Sharon: Another summer classic, Rose of Sharon produces loads of tropical-looking flowers in the heat of the summer. The Lil’ Kim™ varieties grow just 3-4’ tall, and are available in three colors for Spring 2017: White, Red and Violet. 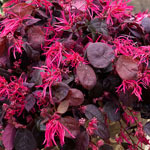 Chinese Fringe-flower: Another plant with season-long appeal, Jazz Hands® Dwarf Pink Loropetalum grows just 1-3’ tall and wide. The outrageous spring flowers appear in spring and contrast with the dark purple foliage. If you need something even smaller, try Jazz Hands® Mini: it grows just 10-12” tall! These are really fun little plants that everyone in Zone 7b and south will want in their yards. Weigela: Wine & Roses® is a fabulous plant, but it can get a little too big for some situations. That’s why we introduced Spilled Wine®. Wider than it is tall, it grows 2-3’ tall and 3’ wide. 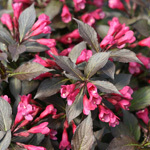 Like the original Wine & Roses weigela, this new variety has intense pink spring flowers and dark purple foliage that is attractive all season long. It’s ideal for foundation and mass plantings. Your customer will need three or five of them, not a single specimen. Winterberry: Spring and summer get lots of attention, but we’ve got something for those of us in the Snow Belt, too. After all, winter comes every year, and we need something to look at other than the drifts of snow. 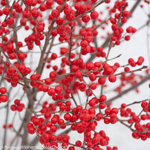 Berry Poppins® winterberry is a heavy fruiting dwarf (3-4’) variety that will brighten winter landscapes in a minimal amount of space. Just remember to plant her consort, Mr. Poppins™, nearby. Smaller plants are a boon to today’s small building lots. They allow homeowners to enjoy the plants they love without having to prune them hard every year. Right plant, right place, remember? They also allow landscapers to create a properly scaled design for smaller sites. This means a garden can have a group of three or five plants rather than one dominating specimen. That’s better for everyone concerned. Compact and dwarf plants are also an opportunity for independent retailers to demonstrate their advantages to consumers. You know what you’re talking about; the kid at the big box may not. Explain why you recommend one of these newer varieties over the bigger ones – and make that recommendation! This is a perfect example of how independent garden centers are in business for long-term customer satisfaction and not just a few months of color sales. That giant evergreen blocking the front window? It was probably bought by someone who didn’t get good (or any) advice when they bought it. Is there anything nicer on a warm summer day than a spot under a shade tree? Maybe a spot under a shade tree with a good book and a cold beverage. But welcome as it is in the heat of the summer, shade can be a challenge for gardeners. The secret is to embrace the shady areas in your landscapes. Stop trying to wish sun loving plants into growing in shade; there are plenty of shade tolerant plants that will thrive in these areas. And I’m not just talking about hostas. Don’t get me wrong, hostas are great. But they aren’t your only option. Some of our durable native plants like Itea and Diervilla will do very well in shade. 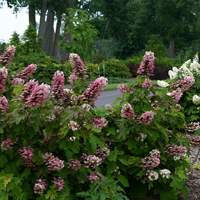 Little Henry® Itea is a dwarf variety that fits well into residential landscapes. While Itea does well in moist locations, Diervilla is one of the few plants that will grow in dry shade. 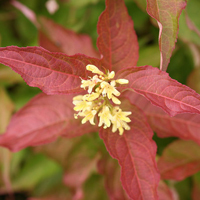 Both plants produce summer flowers and have attractive fall foliage: Kodiak® Diervilla varieties were selected for their rich spring and fall color. As with many plants, flowering and foliage color may be more subdued in shade than in full sun, but you will still have a lush planting. In any landscape you need to think about all four seasons. That means evergreens. Both Buxus (boxwood) and Taxus (yews) do well in shade. However, deer like Taxus and they don’t like Buxus. That gives Buxus the edge. A lesser known evergreen with good shade tolerance is Microbiota, or Siberian Cypress. As the name suggests, this is a very cold hardy plant. It is low growing, with feathery foliage that turns russet in fall. Celtic Pride™ is our choice for its excellent disease resistance. Shade doesn’t have to be all about foliage. 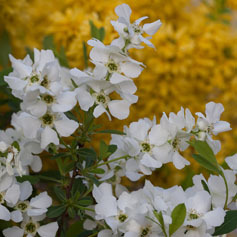 For spring, consider Exochorda like one of our Snow Day® plants. While not suited to deep shade, they put on a delightful spring flower display in dappled shade. Hydrangea quercifolia (oakleaf hydrangea) is a classic choice for woodland settings. 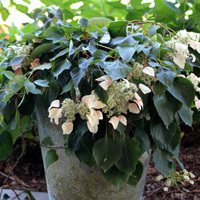 The Gatsby® oakleaf hydrangeas have showy summer flowers and intriguing burgundy fall foliage. Some plants embrace the shade tree. Literally. Schizophragma (false hydrangea-vine) grows up the trunk of shade trees and produces elegant summer flowers. Rose Sensation™ Schizophragma has distinctive pink blooms. This is a slow growing plant, so be patient. It’s worth the wait. Shade plants are often more subtle than their brash sunny cousins, so plant with an eye for texture and form rather than relying on color alone. Layering a variety of textures in a space invites visitors to sit and rest for a while in the shade. And on a warm summer day, what could be better? Ah, deer. Gentle, majestic woodland royalty. Or hosta-eating road hazards, depending on your point of view. Most gardeners have a tortured relationship with deer. We don’t have anything against them except for the fact that they eat everything in sight. Repellants can work, but you need to apply them regularly. A deer fence will keep them out, but is often impractical. What’s a gardener to do? You can start by choosing plants that deer don’t like, though there’s no such thing as a deer-proof plant. Hungry deer will eat anything. But you can make your yard less appealing than the daylily buffet next door. Not very neighborly, I know, but you can make it up to them with a nice bouquet from your cutting garden. Deer avoid plants with fuzzy leaves and those that are strongly aromatic. Some gardeners have success planting catnip, lavender and thyme; their strong scent can deter deer from eating more desirable plants growing nearby. Daffodils are also unappealing to deer, and can act as an early season deterrent. The world always needs more daffodils, anyway. Although deer do not like prickly leaves, they aren’t bothered by rose thorns. So don’t plan on a rose hedge as a good barrier. Barberries, on the other hand, are seldom eaten. They’ll keep the jealous neighbors out of your cutting garden, too.Unfortunately, deer like new plant growth. So that new bed filled with lush, tender plants is very tempting to whitetails. Even plants that are not especially tasty to deer can be appealing when they are leafing out. You may want to invest in some deer repellant for these plantings, at least until their new growth has hardened off. Plants that are unappealing to deer include Forsythia, Viburnum, Potentilla, Spiraea, and Syringa (lilac). Working with these plants will give you a good start on a garden with season-long color. Add some Juniperus and you’ve got year-round appeal. Rutgers University has an excellent reference that rates the deer resistance of landscape plants. If you’re in an area with heavy deer pressure, there are some plants that you probably want to avoid planting. Thuja (arborvitae) is a year-round treat. When you go into the north woods you will see arborvitae eaten as far up the trunk as a deer can reach. Sometimes even higher: that’s a sign that the elk herd has moved in! Other deer favorites are roses, Euonymus (including burning bush), Magnolia, and Rhododendron. Hydrangea is a common target, too. Remember that hungry deer will eat just about anything. Winter and early spring are the lean times when deer are most likely to eat your plants. In fall they are bulking up for winter, and are especially voracious. In summer time, when the living is easy, they are much more selective. Whatever you do, DON'T FEED THEM. They won’t eat your offerings and leave the landscape alone; they’ll learn to come to your place for dinner. And the day you don’t have a nice spread waiting for them is the day they will turn to your new hydrangea planting instead. Besides, feeding deer isn’t healthy for them. It’s often not the nutrition they need, and can contribute to the spread of disease. If deer are a serious problem in your landscape, it may be time to call in the professionals. Your local nursery or landscaper likely offers some sort of treatment. These repellants won’t hurt the deer, and will allow you to enjoy your yard without the frustration of seeing flowers eaten just before they bloom. Mother’s Day is coming, and you know what that means: shoppers looking for something nice for Mom. Trust me, mom doesn’t want a scented candle or a box of chocolates that she’ll be expected to share. She wants flowers. And why should she settle for a mere bouquet when she could enjoy a garden plant that will flower for years to come? 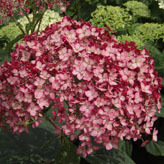 Most hydrangeas sold as Mother’s Day gifts are Hydrangea macrophylla (bigleaf hydrangea). People often ask if they can be planted in landscapes after the holiday. Yes, they can, but varieties used by florists are selected for forcing in greenhouses rather than landscape performance, so their garden success may be hard to predict. H. macrophylla flowers are affected by soil. In acidic soils with aluminum in them, flowers will be blue. In basic soils, or soils without aluminum, flowers will be pink. This is true of H. serrata (mountain hydrangea) as well. It can take a season or two for flower color to change. 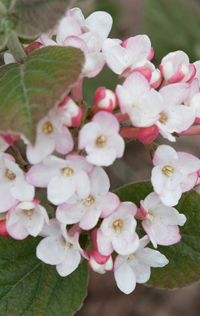 The default for most container grown H. macrophylla is pink flowers. Once planted the flower color will change to purple and blue if the soil is acidic and contains aluminum. Soil does not affect the flower color of H. paniculata, H. arborescens or H. quercifolia. What you see is what you get, although many varieties will open white and transform to pink later in the season. H. macrophylla , H. serrata and H. quercifolia bloom on old wood. Prune them immediately after flowering. Better yet, don’t prune them at all. H. paniculata and H. arborescens bloom on new wood. They may be pruned in late winter. Reblooming H. macrophylla and H. serrata bloom on both old and new wood. It’s still best to avoid pruning them, but if you have a hard winter and the plants are damaged, gardeners will get a second chance at flowers with the new growth. Look for the second round of blooms in late summer. 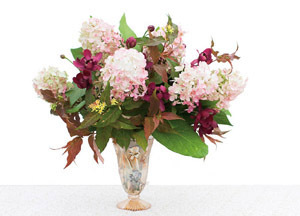 Mother’s Day hydrangeas are a great opportunity for you to connect with your customers. They’re also a good starting point for a complete Mother’s Day package: plant, soil conditioner, vase for cut flowers, etc. Maybe a small box of chocolates, one that she won’t have to share. Because you know what they say: if Mom isn’t happy, no one is happy. Make Mom happy! After a deceptively mild December, winter showed up with a vengeance in January. Freezing cold, plenty of snow, and some ice mixed in for good measure. February is likely to bring more of the same (sorry, but you know it’s true). When you’re not thinking about how much you don’t want to shovel yet again you’re likely thinking about the promise of spring. And if you’re not, your customers are. Forsythia. It’s not really spring until the forsythia bloom. If you’re going to have a one-hit wonder in your yard (and after this January you deserve some forsythia cheer) do it right. 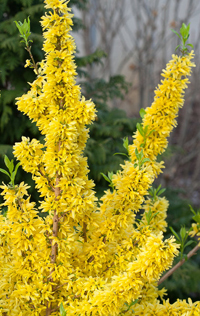 Show Off® has the best bloom display of any forsythia on the market. Available in regular, portion-control and bite sized versions. Chaenomeles. Quince are another traditional herald of spring. The candy-colored flowers are just what we need after a grey winter. Double Take™ quinces have huge, doubled flowers for extra impact and are thornless. That makes them especially good for those of us who can’t wait for warm weather and want to cut some for forcing indoors. Why not sell a pretty vase along with the plant? Deutzia. You want spring flowers that look great when shoppers are in the store. They want a plant that will stay small without pruning. And even if you don’t want to think about it now, you would like some colorful foliage this fall. Yuki Cherry Blossom™ and Yuki Snowflake™ deutzias have all that and more: they’re deer-resistant, too. You’re welcome. Viburnum. There are viburnums with summer flowers, and viburnums with fall color. But right now I’m talking about a viburnum with fragrant spring flowers: Spice Girl®. Her spicy sweet flowers are hard to resist. I deserve this plant, and so do you. It’s our reward for the pre-swimsuit season diets we will be starting tomorrow. Get that want list together and call your nursery supplier today. Because if you wait until spring, well, you know what nurseries are like in spring. Call them now, while they’re snowed in!